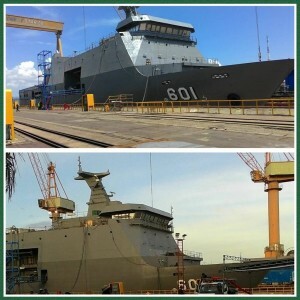 The SSV is based on the Indonesian Navy's improved Makassar class Landing Ship Dock (LPD) and was built by PT PAL in Indonesia from a design by Daesun Shipbuilding &amp; Engineering of South Korea. 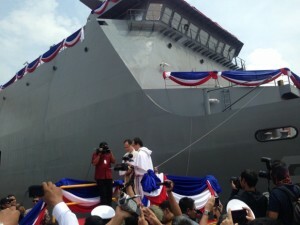 Based on technical specifications for the Philippine Navy version of this design have been made public, this variant of the class has expanded spaces for command and control systems, which allows it to function as a flagship, and incorporates semi-stealth technology. 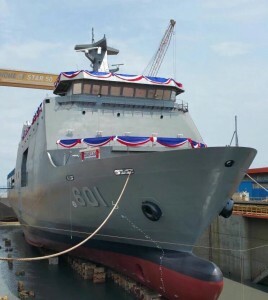 It has a displacement of 7,3000 tons, and is 120 meters long, which is twenty-two meters longer than the previous Philippine Navy record holder: the 103-meter supply ship BRP Mactan. 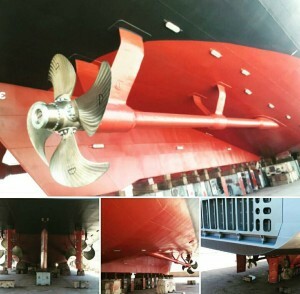 The ship has maximum speed of 16 knots, with a cruising speed of 13 knots. 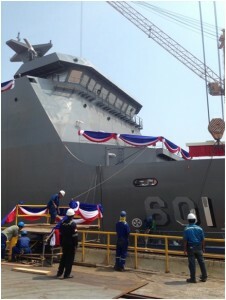 Based on insights gleaned from its Indonesian sisterships it has a range of 10,000 miles, and can remain at sea for 30 days. 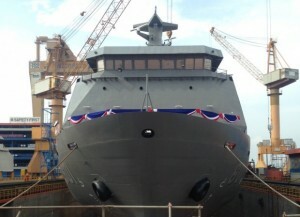 It is equipped with a bow thruster for, among other things, autonomous in-port maneuverability. This article chronicles the progress of construction. The data assembled below largely comes from open-sources and is thanks in no small part to Indonesian Timawans who monitor Indonesian news reports and share them with the Timawa community. Supplemental data was gleaned from the international press. January 19, 2016. 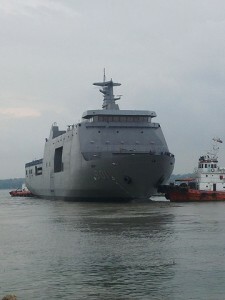 After the PT PAL spillway had completely flooded, the BRP Tarlac was floated out and brought along side an adjacent pier where work continued on its internal spaces. Photograph c/o Gombaljaya on the Timawa FB extension. January 16, 2016. 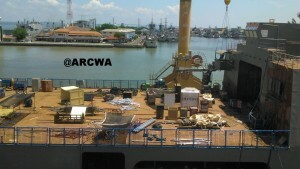 More hull details Photo shared on Timawa FB honeypot by Alberth Minas and the main Timawa forum by Tonnyc@TMW. January 12, 2016. Painting in progress. Photo c/o Alberth Minas on Timawa FB honeypot. November 27, 2015. 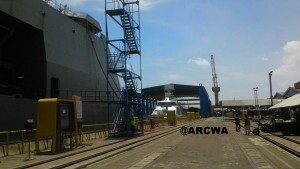 View of the well deck, helideck, and entrance to the hangar. While the photograph was shared on the Timawa FB extension on the 27th, the contributor, Alberth Minas reported that the photograph had been taken two weeks prior. 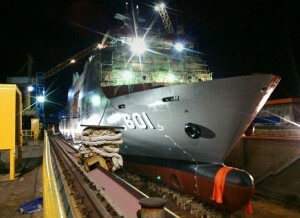 A Liberian-registered merchant tanker on Monday night collided with a Philippine Navy vessel in Zamboanga City. 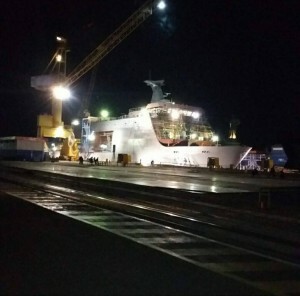 The Philippine Navy said merchant tanker Tasco, with Filipino and Ukranian crew, collided with BRP Tarlac while the naval ship was anchored 1,000 yards south of Ensign Majini Pier at Naval Station Romulo Espaldon at around 7:46 p.m.
Rear Admiral Jorge Amba, commander of Naval Forces Western Mindanao, said no one was hurt among the crew members, but the naval vessel sustained a minor damage in the right forward bulwark and side ramp. News report of the incident. 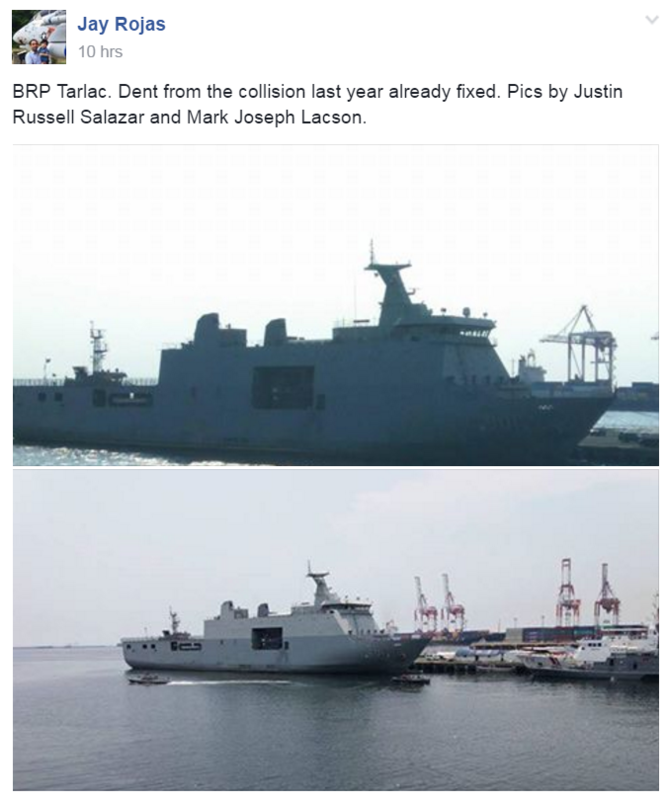 BRP Tarlac will be participating in the PHIBLEX 33 exercise. MANILA, Sept. 25 (PNA) -- US marines and sailors from the US Marine Expeditionary Brigade and the Bonhomme Richard Expeditionary Strike will be participating in the 33rd Philippine Amphibious Landing Exercise (PHIBLEX) which will take place in various locations in Luzon and Palawan from October 4 to 12. Humanitarian civic assistance efforts, an amphibious landing exercise and live-fire training featuring artillery are just a few of the many team buildingopportunities during PHIBLEX 33, all designed to advance cooperation, improve inter-operability and assist in strengthening bilateral amphibiouscapabilities. "The opportunity to train and build mutually beneficial capabilities with our Armed Forces of the Philippines partners is essential for sharpening our bilateral amphibious and humanitarian assistance capabilities, both hallmarks of the US Marine Corps,” 3rd Marine Expeditionary Brigade commander Brig. Gen. John M. Jansen said. “Exchanging expertise and cultivating our longstanding security alliance provides a cornerstone for security and stability in the region, and has for decades,” he added. PHIBLEX 33 will include approximately 1,400 US service members based in Okinawa, Japan and 500 Filipino personnel working side-byside to grow capabilities and better prepare to operate together during a natural disaster or armed conflict. The humanitarian and civic assistance portion of the exercise, beginning this month and concluding on Oct. 12, includes engineering projects to improve local infrastructure and health engagements to exchange medical best practices and supplement the medical needs of Philippine citizens. Field training during the exercise includes small arms and artillery live-fire which will provide the and US Marine units multiple opportunities to maintain and sharpen their skills while enhancing an already high level of inter-operability. Additional US units participating include Amphibious Squadron 11, the 31st Marine Expeditionary Unit and the three ships of Bonhomme RichardAmphibious Ready Group (BHR ARG). The ARG consists of the USS BHR (LHD-6), the USS Green Bay (LPD-20), and the USS Germantown (LSD-48). 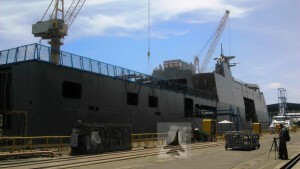 Indonesian shipbuilder PT PAL has confirmed that it is working with the Philippine Navy (PN) to determine the extent of damages sustained by the service's first-of-class strategic sealift vessel (SSV) in a collision on 19 September. 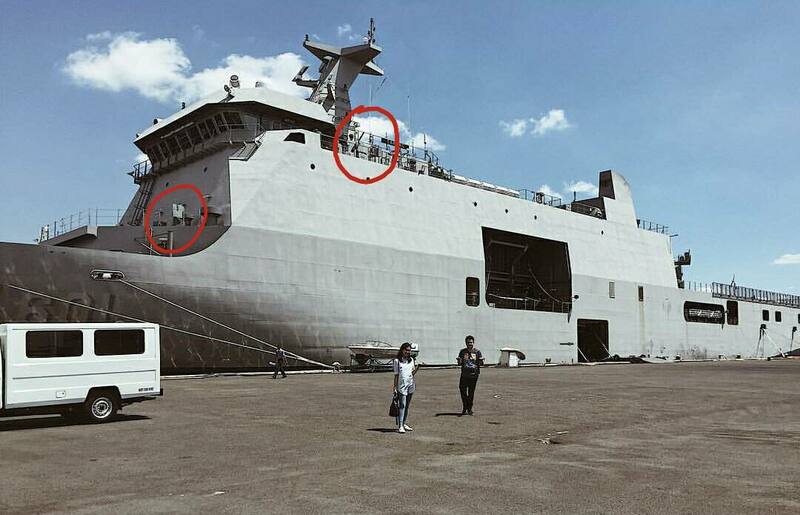 Initial assessments suggest the damages suffered in the incident are minor, and mostly localised in the ship's bow section at the point of impact. 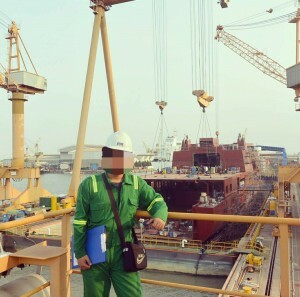 The inspections will cover components including the vessel's hydraulic systems, electrical systems, and hull scantlings to ensure the platform's structural integrity has not been compromised. 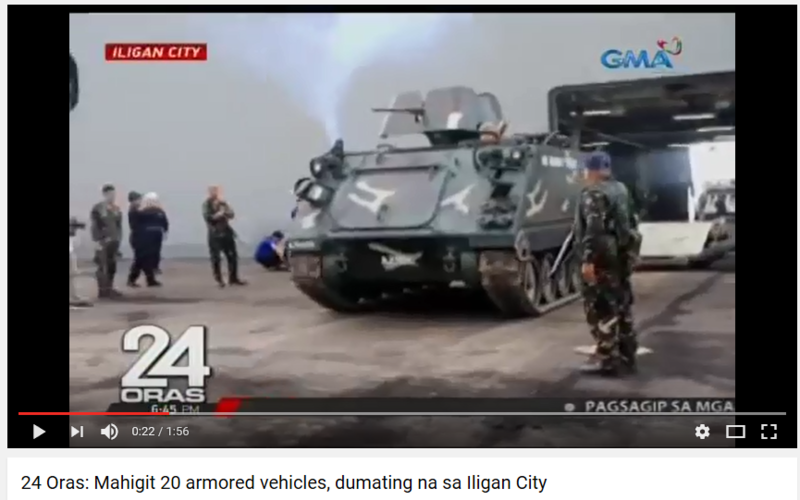 Im guessing those are .50 M2 BMGs rather than 20mm manual guns? MANILA, May 29 — Full speed ahead. 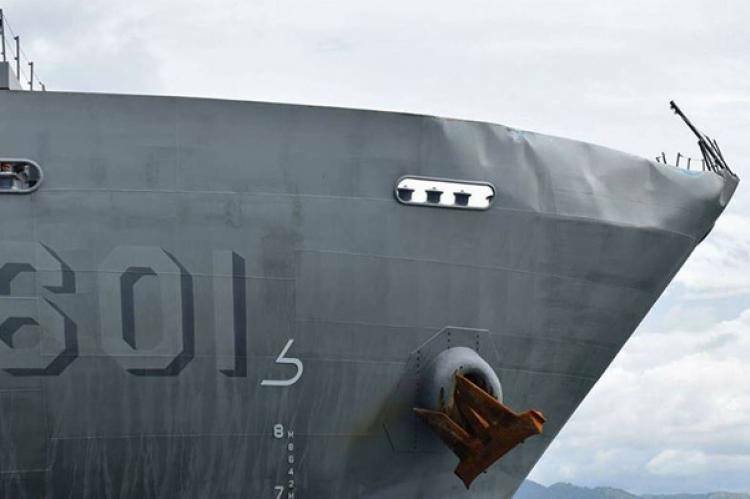 This was the apparent message of the Philippine Navy (PN) as it dispatched Monday the BRP Tarlac (LD-601), its first strategic sealift vessel, to transport military vehicles and other supplies which is essential to dislodging the Maute Group terrorists in Marawi City, Lanao Del Sur. PN spokesperson Capt. 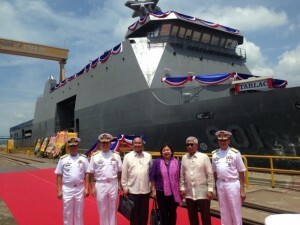 Lued Lincuna said the ship sailed from Subic Bay, Zambales carrying 30 military vehicles and 253 tons of essential supplies. 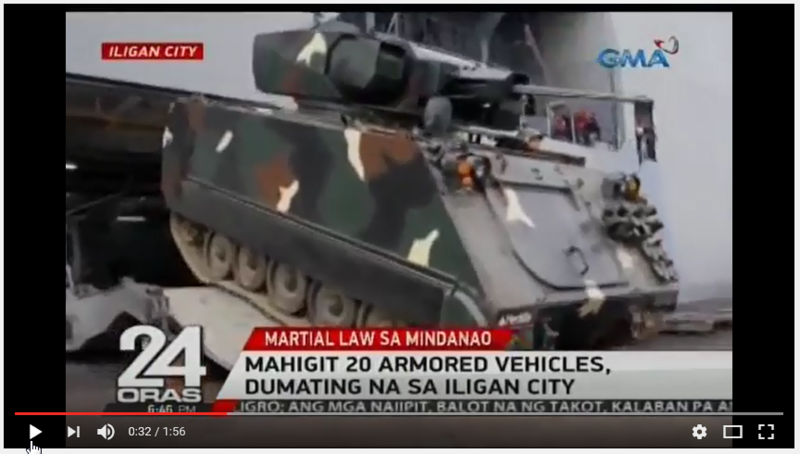 These cargos will be distributed to the different AFP units in Mindanao to cater to the transport and logistical requirements of the ongoing military operations against terrorists. 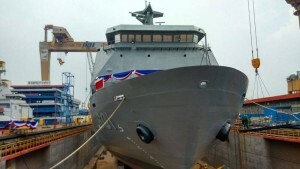 The ship, with its capability to accommodate more than 4,000 tons of cargo and 500 personnel onboard, is utilized not only to support military operations, but also for mass evacuation and even international humanitarian assistance during disasters and crisis. 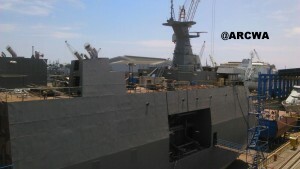 I guess this is the reason why, I saw FF11 in subic bay recently.